To satisfy your post weekend curry craving, the SUSU shop are hosting a special curry tasting session in The Pod on the 4 November. Organised in association with the Kitchen88 range of ambient curry and noodle ready meals, you will have the chance to sample a variety of tasty dishes – from tantalising Thai green chicken curries with fragrant jasmine rice to scrumptious satay chicken ramen noodle. What makes these curries unique is that they are all available after just 90 seconds in the microwave! 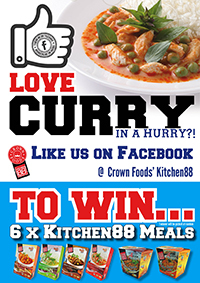 As part of the day you also have the chance to win the ready meals to enjoy at home – perfect for when you need your curry in a hurry! To enter all you have to do is click “LIKE” on the page and you will automatically be entered into a draw to win. Click here to be entered into the draw.